Images and graphics of Saturn and its ecosystem. Is there a better alternative to Saturn? Is Saturn really the best app in Teaching Tools category? Will Saturn work good on macOS 10.13.4? Saturn is an astronomy app that has over 500 images and graphics of the planet Saturn, its extensive ring system, and 7 major moons: Mimas, Enceladus, Tethys, Dione, Rhea, Titan, and Iapetus. There is extensive and detailed coverage of each of these worlds including over 100 topics. Cutting edge astronomy and beautiful images returned by the Cassini probe are augmented by a futuristic GUI. New images and updated information about Saturn and its moons. 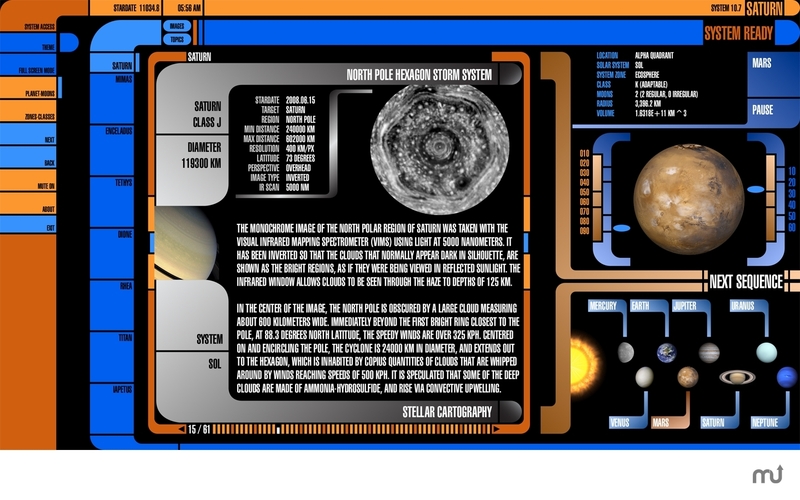 A new section that describes all of the planetary classes and zones from the TNG Stellar Cartography database. Saturn needs a review. Be the first to review this app and get the discussion started! Saturn needs a rating. Be the first to rate this app and get the discussion started! You can learn about the Saturnian magnetosphere and how it interacts with Saturn's moons, the amazing hexagonal storm system that encircles the north pole of Saturn, and the huge south polar cyclonic vortex. View the progression of a huge storm system that erupted in the northern latitudes of Saturn in late 2010 that still rages and completely encircles the planet in a 10000 kilometer band. Saturnian weather is intense, with howling storms and extreme winds that churn the atmosphere and vary with the seasons. Explore the icy plumes of Enceladus emanating from the Tiger Stripe sulci, the wracked and cratered landscapes of the cold ice moons, and the most beautiful, complex and expansive ring system in the solar system. Mimas and Iapetus each have a surface with a crater resembling the appearance of the Death Star. Check out "The Wall" on Iapetus; a mysterious complex ridge system that's hundreds of kilometers long and straddles the equator at towering elevations up to 11 kilometers tall. Start learning and exploring now with the coolest interactive astronomy app ever, and transport your imagination to the 24th century. Animated sequences of the planets Mercury, Venus, Earth, Mars, Jupiter, Saturn, Uranus, and Neptune, and all of Saturn's major moons. The bonus features also have a full-screen view with 3D globes of all these planets and moons, which can be interactively explored, and includes built-in animation around the rotation axis of the planet/moon. You can specify rotation values for all 3 axii, and zoom and position the globes in 3D space.